As I was sitting in my Marriott hotel room selecting one of the two types of pillows they laid out for me – feather or synthetic – I was once again pleasantly surprised with how they had predicted my needs during my stay. At check-in, I forgot my rewards number. No problem, they pulled it up fast. I left my ear buds at home for my workout. That was OK because they had a new set in the machine waiting for me. After the gym, I was tired. The cold towels at the door helped revive me. The next morning, they would deliver the paper with my breakfast, just when I like to read it. I would not consider Marriott a luxury hotel, but the treatment was five stars. I realized that it is not necessarily the extravagance I seek in a hotel, it is having everything I need, when I need it. The same thing can be said about what makes a great ‘case-ready’ operating room. To create a great experience for the surgeons, the anesthesiologists and the patients, what they need most is to have the room set up the best way for the case. The case-ready OR is a concept that goes beyond efficiency in the operating room. It is not enough to be fast, you also have to get it right. What Is a Case-Ready Operating Room? A case-ready operating room is properly cleaned and staged with case-specific equipment, so OR providers have everything they need to deliver exceptional care. This is a procedural model that positively impacts surgeon and anesthesiologist satisfaction with every case. Standardized, lean operations driving setup. Guaranteed best practices in cleaning, every time. Real-time operations metrics – knowing who is setting up the OR and how far along they are. Availability of the required equipment for the type of procedure. Proactive room setup procedures, i.e., nothing is missing. Strong partnership among operating room staff so everything is well choreographed. Improved satisfaction of OR providers! How Do You Implement a Case-Ready OR? Using analytics to refine and improve operations. Each step builds on the step prior, making incremental improvements every time. Theoretically, you could tackle just Step 1 and see a big impact. Also know that while it seems like a simple three-step list, each step can take six to 12 months to implement. Going back to my hotel analogy, when you think about hotel chains, they have standardized everything. This is so the experience is the same whether you are in Tokyo or Tulsa. This is not unlike how to approach standardizing OR turnover operations. Implement a set of standards for cleaning and OR setup procedures. Be sure to document them. This establishes a baseline, and it is this baseline from which improvements can be made. Clarify who needs to do what and when. In an OR, many parties need to work together in a small space. Clearly defining roles keeps things running smoother. It also ensures everyone understands what the definition of “ready” is. Get rid of non-value add work. Identify the tasks that can be eliminated and replace them with high value-add tasks instead. Only after perfecting standardization can you begin to allow for some degree of personalization. This is also not unlike hotels that are using analytics to discover the needs of guests, and to personalize the experience. The No. 1 way to personalize the operating room is through its accurate setup according to the case-specific preference card. The preference card includes required equipment, surgical supplies, and nursing instructions. However, preference cards are a big issue today. They are often outdated, incorrect, or even missing. This leads to a lack of trust in the cards altogether. The preference cards are not needed because they already know what the surgeon wants. The card is not up to date, and it is not their job to change it. The card changes so much that they cannot keep up. They never read the card. Devise a system to create and maintain accurate preference cards. Remember, though, that even if it is accurate it still may not be accessible to the people that need it. Ensure the preference card is easily accessed by OR staff that are setting up the room. This usually means implementing technology. For example, my company offers the ReadyList Surgical application for equipment technicians to access case-specific equipment lists. Other technology has proven successful as well, such as that used at Intermountain Healthcare which accurately captures case-specific surgical supplies. Please note that I am not advocating to standardize preference cards. For example, hospital administration demands all surgeons use the same surgical supplies because it is more cost-effective. My guidance is that you address the issue of preference cards not being correct and available at the time they are needed: as the operating room is set up. Traditionally, operating room staff assignments are managed via whiteboard and paper. This requires herculean efforts to prepare metrics for the purpose of improving operations. Once you have technology in place, finding areas where you can refine and improve OR operations should be much easier. This way, you can focus on making progress versus trying to gather and prepare data by pen and paper. Here are a few sample lists you can use as you start to think about creating a case-ready OR. Use these lists as a baseline to standardize OR turnover procedures at your facility. Perform “end case” on the monitor. Replace suction, circuits, EKG patches and pulse oximeter. Fill vaporizers and hot lines as needed. Check and replace C02 absorber as needed. Remove excess moisture from water trap. Clean and remove all extra equipment. Verify BP cuffs are available in all sizes, stock cart, and remove all extra supplies. Confirm emergency backup oxygen tank and Ambu-Bag are present at time of turnover. Ensure anesthesia cart is locked. Check with the circulator and return blood products and/or coolers to the blood bank. Clean all equipment not needed for the next case. Retrieve all case-appropriate equipment for the next case. Check OR table for cleanliness. Check for correct bed and room setup according to the preference card. Set up as supine if there is no case to follow for the next day. Clean all equipment not needed for the next case before taking it out of the room. Remove all equipment that is not needed for the next case. Collect and remove all trash, bio hazard waste, and linens. Check sharps container. Close, seal, and replace at 2/3 full. Wipe down overhead light with hospital-approved disinfectant (HAD). Wash horizontal surfaces of furniture and equipment with HAD. Remove Neptune and begin cleaning procedure. Inspect walls and clean debris as necessary. Clean the floor of debris using a wet microfiber mop with HAD, and place “wet floor” sign. Restock gloves, disinfecting wipes, and hand sanitizer dispenser. Visually inspect room to ensure cleanliness and spot clean as required. 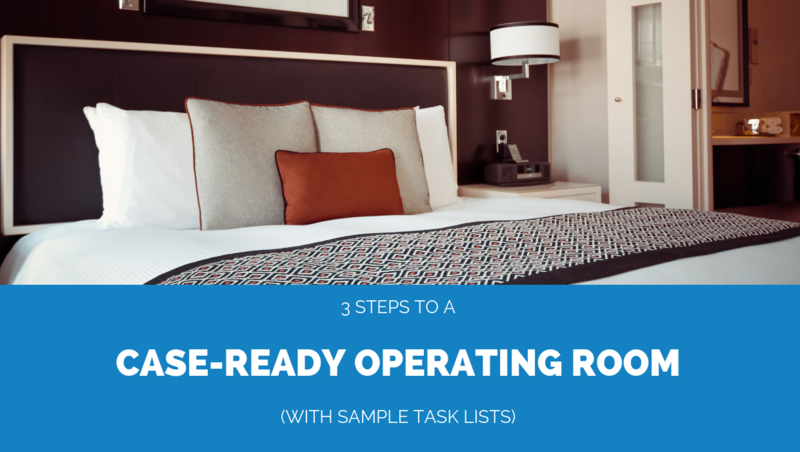 Just like a five-star experience at a hotel leaves you feeling satisfied and looking forward to the next visit, a case-ready operating room can boost the morale of your surgeons and anesthesiologists. Most importantly, it allows them to provide better care for the patient when it matters most.